Here’s another photo of the week where it’s all about being in the right place at the right time. 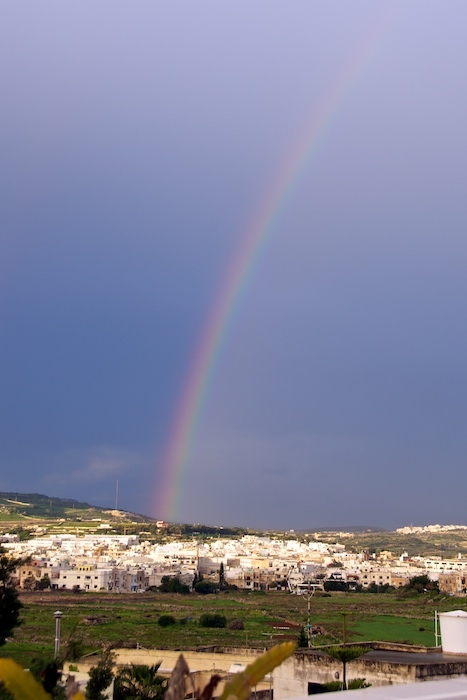 I can’t remember the last time I saw a rainbow in Malta – in fact, I can’t remember the last time I saw a rainbow anywhere and I had a camera handy. Needless to say, I haven’t got a clue what’s the best way to shoot a rainbow. Unfortunately I was running late so I only had a few minutes to spare this rainbow’ish morning so I clicked a few horisontals and a few vertificals with the Nikkor 18-200mm lens which was on the camera and I left. 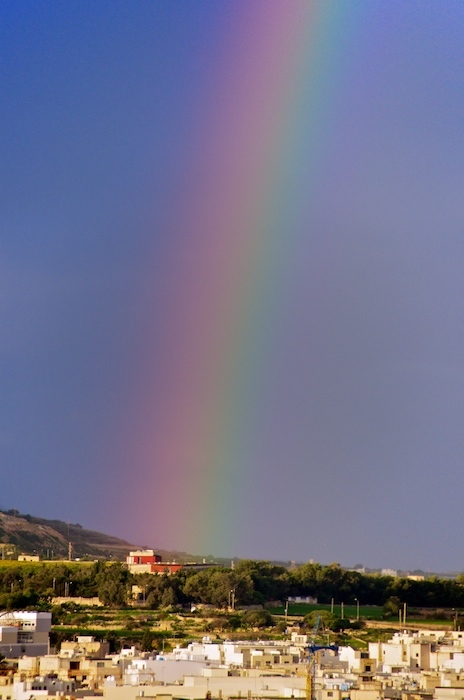 Any ideas how to make my next rainbow shot better? Leave a comment below! Neither do I and neither does most anyone! I suspect the “best” way is using some filter on the front of the lens, but I don’t know which one. I’m guessing a polarizer might make the colors more vivid, especially the sky, if you’re standing at a 90 degree angle to the sun. But I don’t know much about filters so perhaps there’s another filter more suited for the task. These are great shots Klaus. I recently got my 18-200mm, but mine is Canon. I’m really having fun with photography even if I can only play with it on weekends (I have a day job). I’ve already done moon shots and water drop shots. I’m hoping I’ll catch a rainbow shot next. I think they turned out beautifully. I saw a rainbow yesterday too, but it was a bit different. We had a rainbow formed from the snow clouds moving into our area. It’s amaizing… For me a rainbow is a symbol of hope, may be because it appears usually after the rain ) Not long ago i saw double rainbow! lovely shots! i think they turned out really well. Good pics! I also have pictured rainbows in my cam! It’s just amazing to see nature’s wonders so beautiful and awesome..
Thats really is a beautiful photograph…I don’t think any tips can make it still beautiful! Great shot. How beautiful it must have been. lovely shots, much nicer if malta is much clearer. but excellent. Next post: Follow-up: Intro to Web hosting – so, how’s TechPatio hosted?